Sea Ray 290 Sun Sport SS, 2001, powered by a pair of Mercruiser 350 MPI EFB, in very good condition. The boat has always been put back indoors during the winter months in the shipyard in Olbia, complete with cushions, shower facility, windlass. DMV within overboard with Bravo One, engines and transmissions sterndrive completely reconditioned in 2016, complete check-up on hull and equipment. The Sea Ray 290 Sun Sport SS is a model designed for fast and safe navigation, the shape of the hull with a deep V ensures low fuel consumption thanks to glide fast times and a smooth ride. The model 290 Sun Sport features an attractive design with rounded shapes and an elegant fibreglass rollbar that rises above the line. Characterized by a large sunbathing area aft, aft teak, which houses the bathing ladder. The cockpit has a U-shaped sofa, two chairs, luggage racks and gavonati spaces for the Guide and a console with GPS. Access to the forward Sun takes place by means of the central part of the windshield, safe even for the smallest passengers. The cabin has a double bed, separate bathroom, useful for layovers at anchor. The boat has about 50 milage from the review is delivered complete with coupon. Visible in Olbia by appointment. Sales support 5% Boat ready for navigation. 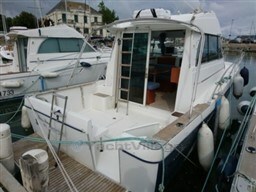 Dear Sirs, I have seen on YachtVillage your offer about Sea Ray Boats 290 Ss - 2001 (code: 482848). I am interested in the offer and would like you to contact me. Thank you. 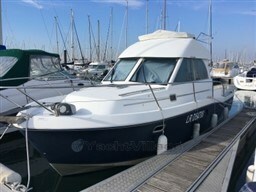 If you would like to find out more about this boat and any other boats of this type and range, Digibusiness Srl,the Company that manages YachtVillage, and Your Boat Broker, the Company that exhibits the Boat, must necessarily acquire some simple details about you (name, surname, email address and, if needed, your telephone number). These details will be processed according to the purposes and means of the processing indicated in the privacy statement under the PRIVACY Section of this website, referred to herein.